The 24 Inch (612 mm) f7.9 Ritchey-Chrétien reflector is the Group’s largest instrument and has only recently replaced the previous 24 Inch Newtonian reflector. The design of the new telescope allows far easier access for visual use by children and the infirm. In most cases access will be directly from the floor rather than from a high step ladder. Access to the dome has also been improved for wheel chair users. Two-inch eyepieces are used with this instrument and the group has a wide range of 2-inch eyepieces specifically for use with this telescope. These give extremely wide fields of view with focus across the whole width which complement the superb optics of the telescope. The drive system is computer controlled enabling very long photographic exposures with sharp focus across the full width of modern sensitive and large dimension CCD cameras. This telescope is fitted with a computer controlled drive system enabling “Goto” and accurate pointing and tracking of a full range of targets. 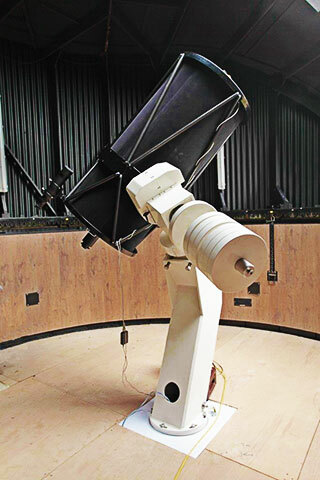 The scope can also be used with planetarium programs enabling star field and object recognition when used with CCD cameras and the computer display. The telescope and cameras can be controlled from a remote Control Desk along with the Dome rotation and interior lighting.